Styled with buswell t-shirt and centinela skirt . I got this in camel. It’s so cozy, goes with a lot of outfits, and have been able to wear it in all types of weather depending on how it’s layered. Definitely worth the cost!I got this in an XS, which I usually do for sweaters. It’s still a little flowy but that’s the look. only M size left when I bought it so it is a little too big for me. I normally wear XS-S. But I am keeping it as it is very comfortable and I real like the lemon yellow. It is a very soft kind of yellow. Super Comfy and cozy, fits a bit larger. I usually wear a medium but this fits like a larger, medium. Making it super comfortable. The stitching is beautiful. I want to wear it all the time and want to get more colors! This sweater is so soft and super cozy. Extremely cute paired with short dresses and stacked booties. Love wearing this around work and after work. While it fits large , it’s still very cozy ! Love the grey hue !! 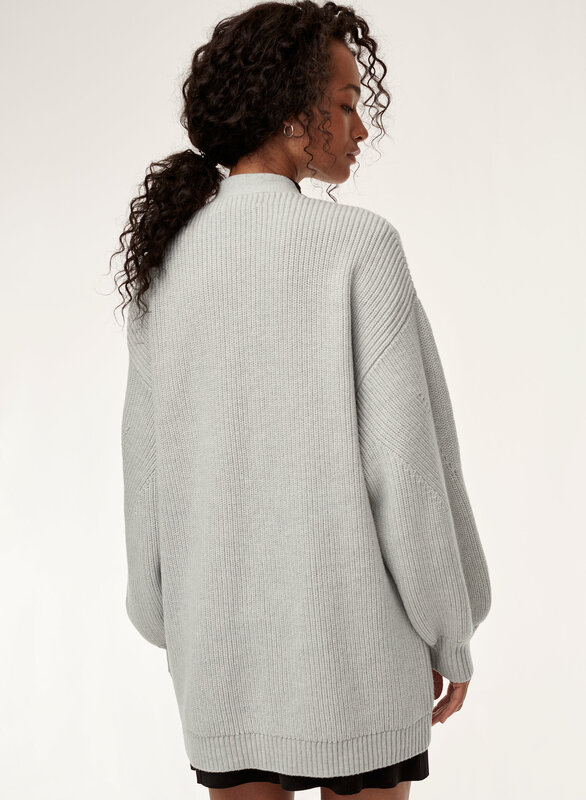 This oversized sweater is my secret weapon because it’s warm, cozy, and when I wear it I feel so effortlessly chic. I love it so much I have it in 3 colours! Ordered in several colors because I love this sweater so much. I love this sweater! I actually like that it fits slightly larger, it's super warm and cozy. The little balls form pretty easily. Very nice and comfortable. Scared to wash it. I like this sweater a lot. It's so warm and versatile, however, it's slightly bigger than I expected. I usually wear xxs / xs , I choice xxs this time, but still a bit longer. Overall, I like it and recommend it. Fit is nice. Beautiful colour. I sized down for it to fit a bit better, but found the arms a bit short in doing so (which made the puffiness around the wrist a little more pronounced). Time will tell how it washes. Love this sweater, it's so cozy! I typically wear a small but based on the comments I ordered an XS. Even after sizing down I'd still consider it to be quite oversized (but that's what I was looking for). Sleeves were also long on me, but that's probably partially because I'm short. Love this sweater, but I learned even though it says hand wash, don't do it, it will shrink (good thing it is oversized). Great quality. Fits bigger so I sized down! Amazing cardigan/sweater. Fits SLIGHTLY oversized but not too much for you to size up imo. I usually am a S/M, and I wear this in a small. Fits right. it's lovely for the winter. A bit big but super soft and comfy! This sweater is nice and cozy. It’s a great quality and very versatile. I can’t wait to get more colors! I'm so happy with this sweater. It's very warm, soft, and flattering. As others have mentioned, it does run small. I should be a size small per the size chart, but the extra small was a much better fit for me—still oversized but not ridiculously so. This sweater is beautiful! I have it in Heather Birch and Constant Camel, and I hope to add more colours to my collection. Quite thick, very warm, and amazing quality. It is very oversized, which I love. I normally wear an XL in sweaters, but in this one the Medium fit well and Large was a baggier, looser fit (which is what I opted for). Highly recommend! I sized down and it’s still gives me the oversized feel. I would say that if you want to purchase it, order it online because I’ve tried this on in 3 different stores and they fit different solely because of them hanging and stretching it. Also it does pill over time so take care of the garment as stated on the tag. 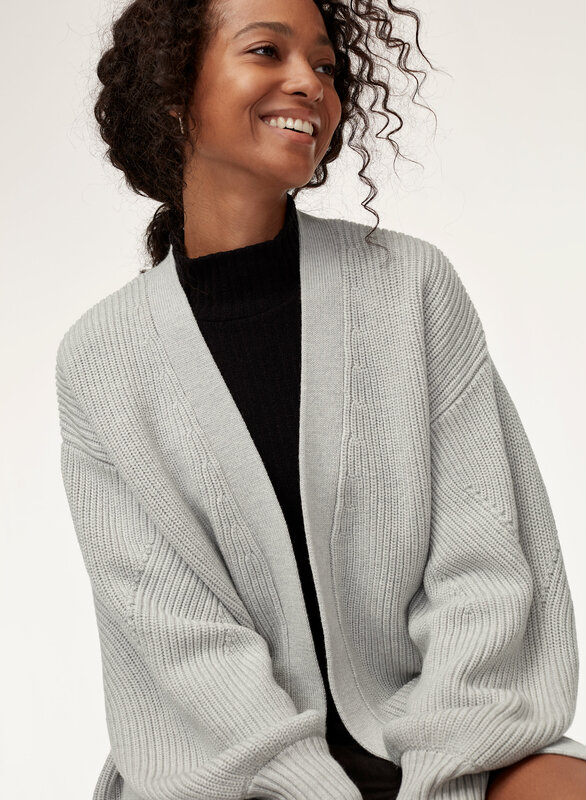 Love this cardigan over all but it is pilling a lot and I only wore it once... it’s sad to see that knowing I paid $165 for this. In love with this cardigan! Super soft and not heavy at all. Got the beautiful Constant Camel color. I love wearing it with leggings or joggers. Love love this cardi, which I got in the Constant Camel color! It’s oversized in such a perfect way. I’ll be wearing this like crazy and getting so much use out of it! Got it on sale, which was an added bonus!!! This is so cute!! I love the detailing on the sleeves... and the sleeves are slightly larger/similar to a balloon sleeve. Which is really cute and different! Love the camel color I purchased. I loved it so much I picked one up for my niece. Great weight to knit. Perfect length and lovely full sleeves. Warm, comfortable and is working perfectly with a baby bump this season! Such a nice sweater, unbelievably cozy. Seems like it would get pills easily but the softness of the fabric overall, is worth it. I was looking for a stylish black cardigan to wear with tights & skinny jeans. This sweater is perfect. Because of the relaxed fit I did go down a size. This sweater is the perfect baggy-comfy-chic. So easy to dress down and up. Not to mention it’s super warm and really soft, not itchy at all! Nice cardigan! Great color and very comfy. 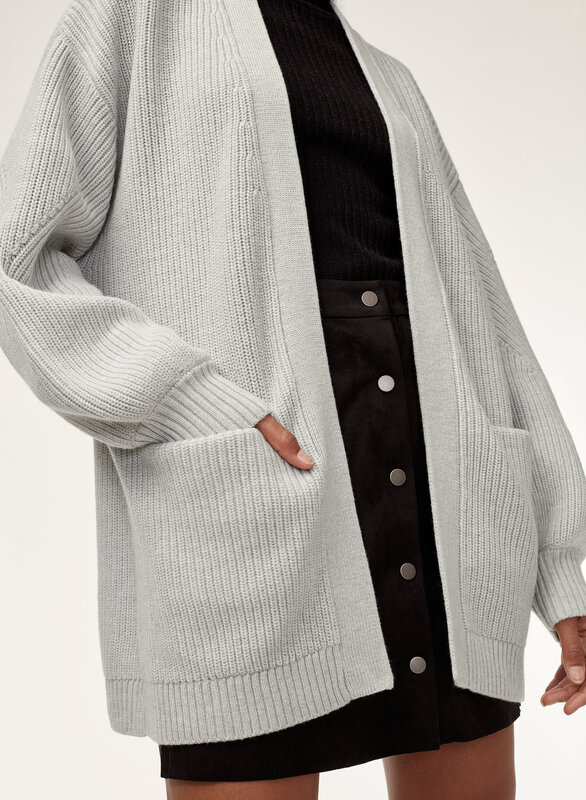 From the moment I put it on, I fell in love with the fit of it, the comforting texture and thickness, the warmth it gave, and the simply chic style it brings to your outfits. It can be dressed casually and more formally. Definitely recommend this and I will personally be getting more colours! Gorgeous blue colour. Love the full sleeves and long silhouette. Great fabric - firm to touch but drapes. Feels very “rich”. Would love in other colours too. Bought this in a second colour because the quality is amazing and you can dress it or down. Such a great cozy sweater for the cooler weather. I got the Tamarind color. The color is slightly different from the picture but it’s still very cute. Love the weight of the sweater too. It’s not too light and not crazy heavy. It just feels like great quality! Definitely a sweater you can keep for years and years! Favourite Cardi ever. So soft, so comfortable and a tiny bit baggy which I love !! This sweater is loosely fitted. It is perfect to be thrown over a shirt or a shirt, and the sleeve of my shirt can still be fitted in the sweater. I order in red, and I like the color very much. Would reorder in a different color. Love this sweater! But the Tamarind colour is much different in person than it is in the picture on the web page. Slightly disappointed in that but I still love the sweater! The fabric is nice and warm. Sadly, I didn't realize that it would be that baggy or I would have ordered a medium. Usually I’m an extra small but ordered down because of the oversized fit and was glad I did it looks still oversized but not overly too big on me . Beautiful I bought black and camel and I love them both! Love it! Just let people know that it should be dry clean only. Even hand washing will ruin it. Gorgeous cardigan that can be dressed up (with a flowy silk dress and heels) or down (with a pair of jeans and a tee). 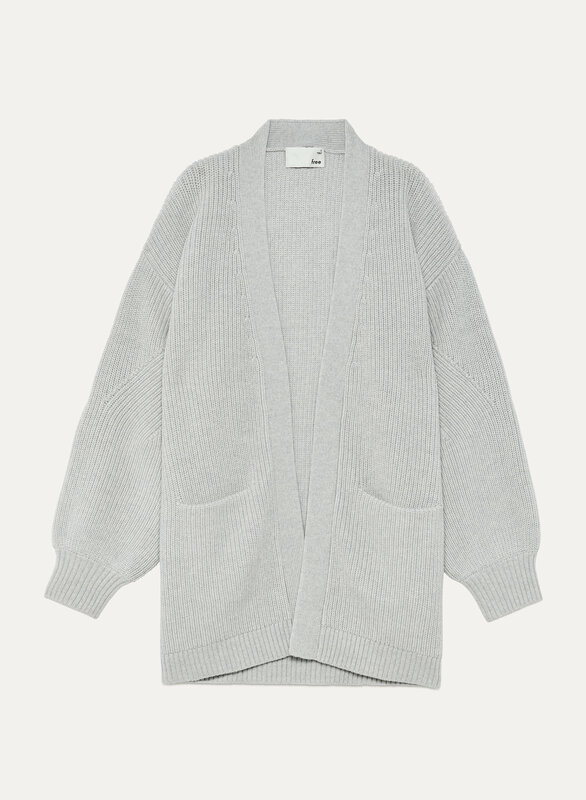 The cardigan is made of pure soft wool and has a nice weight and drape to it. I am tall but slim and normally size up for my height. 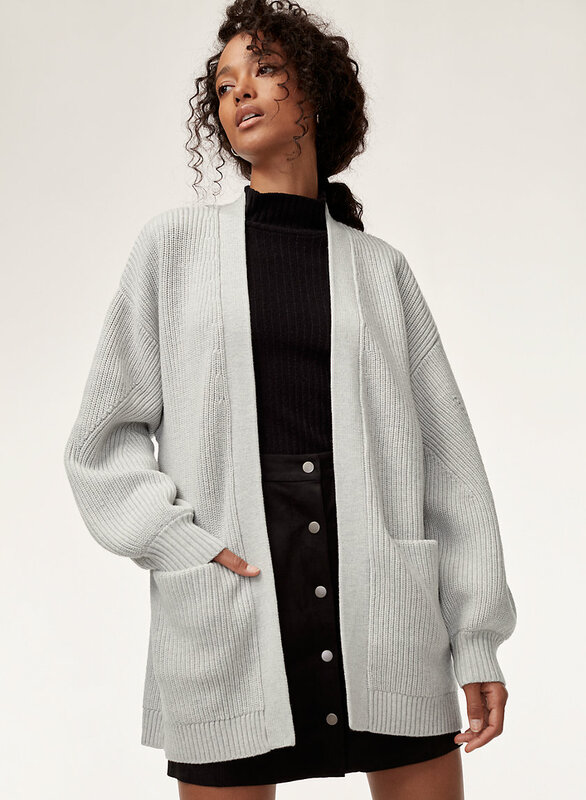 Another timeless piece by Aritzia!